NEW YORK (WABC) -- Two NYPD detectives who removed the pressure cooker bomb from a Chelsea street and dismantled it were promoted Friday. 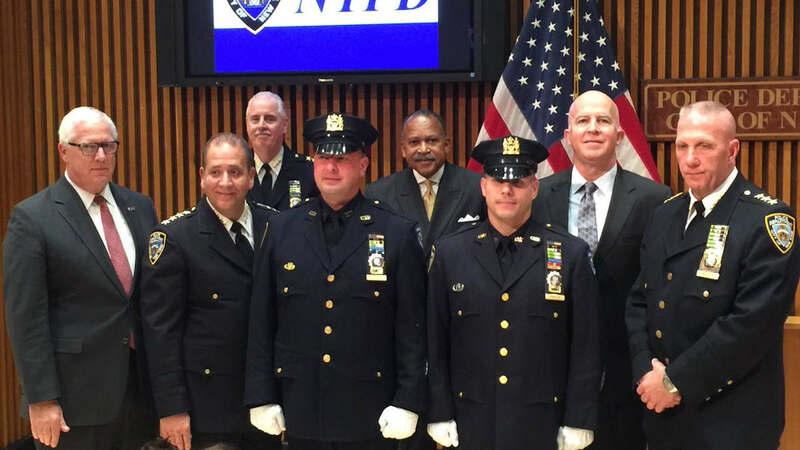 Detectives Jason Hallik and Anthony Mason were promoted to second-grade detective for their work on September 17, when they were part of the team that removed the bomb from West 27th Street, dismantled it and analyzed it. The pressure cooker was allegedly left by terror suspect Ahmad Rahami, but it had failed to explode. And no one knew if it could, or if it would, when the bomb squad moved in. "Whether it's an empty package or it's something, you're out there trying to protect everybody and just do your job," Hallik said. And that day, the job was to take the unexploded device and put it into a containment truck. Hallik did it robotically, and the next day, it was Mason's job to render the device safe. But most importantly, they successfully dismantled the bomb without an explosion so it could still be used as evidence. Both heros are humble about their work and their courage, doing a job most of us would never do. "Every device you take care of saves lives," Hallik said. "It's human life. Nothing is more satisfying than that."